A communication channel for announcements and electronic records of student academic results. Emails sent to Parents summarising lessons and homework for the day. Students’ arrival at School, and urgent notices, if any. Parents get to discuss their child’s progress with teachers in person. Our PSG plays an important role. It helps foster strong working relationships among parents, teachers and the school, in support of our students. 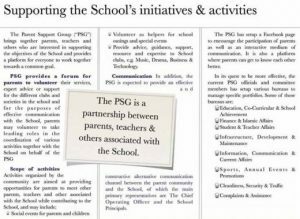 Here at APSS, we promote parent involvement in the school through the PSG.